The February Challenge is all about color – you pick a color each week and document those colors. So my first color will be my favorite color… clear. It’s a great color because it takes on the color from the things around it. So it’s every color and no color all at the same time! Now I realize that many of you may think that clear is not a color, but ask yourself this… what color are your windows? What color are your glass dishes? What color is water (assuming it’s clean)? How about diamonds? My wife hates the fact that I insist clear be my favorite color, so this week is dedicated to her. 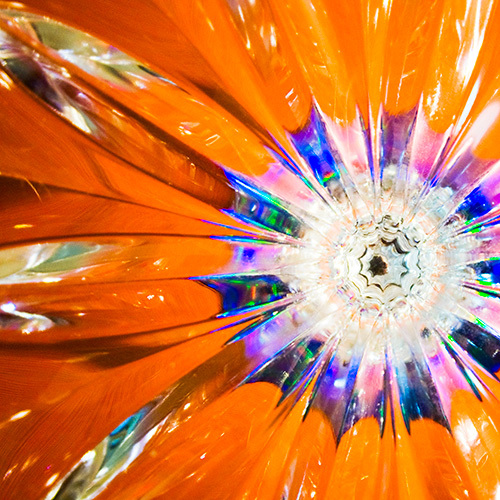 This particular image is an abstract of a CLEAR glass candy dish lid positioned on top of a purple DVD-R with an orange background (a shirt). The DVD served to reflect some nice rainbow colors that you can see in the refraction of the CLEAR glass. So is anybody else joining in with the February Challenge? To see the rest of my February Challenge photos, check the “Challenge” category here on the blog or visit my Flickr Set. This entry was posted in Challenges and tagged abstract, art, art and photography, blue, California, challenge, circle, circular, clarity, clear, color, color image, colorful, colour, colour image, colourful, digital video disc, dish, DVD, DVD-R, february challenge, februarychallenge, februarychallenge2008, fine art, Flickr, flora, flower, foto, glass, green, lid, orange, pattern, photo, photography, photos, project, purple, radial, reflected, reflecting, reflection, refract, refraction, round, San Diego, shape, square, symmetric, symmetrical, symmetry, tableware, United States on February 2, 2008 by Brian Auer.